Importance of Establishing a Dental Home - Adelberg Montalvan Pediatric Dental PC & Orthodontics too! As a parent, one of the most exciting events in your child’s first year of life is watching their first tiny baby tooth come in. And one of the most important things you can do for their oral health at this time is establish a dental home! 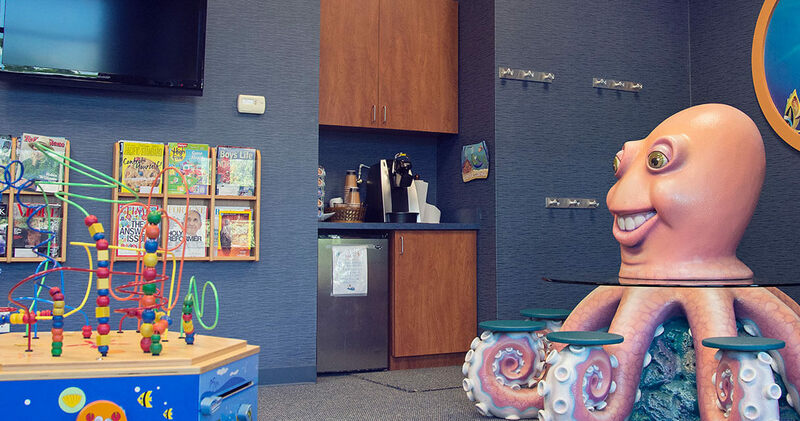 One of the first visits your child has at the office should involve more than just their oral care. At a meet and greet, your child should meet the staff, get a feel of the dental chair, and even learn a few things about the tools that we use. We’ve found that most children fear strangers more than going to the dentist, so a meet and greet will help ease their anxiety. With the meet and greet handled, we will then focus on creating positive experiences that prevent the development of new dental fears. Our state of the art equipment allows us to do things such as provide no shot treatments so that your child does not associate going to the dentist with pain or discomfort. Being a parent often feels like stepping into new territory without a guide map. Fortunately, your child’s dental home is the one place you know you can go to get the answers that you need on how to care for their teeth. Are you worried about a baby tooth that seems to be growing in wrong? Or maybe you need help getting your older child to floss. We’ve got all of the answers to those questions and more, and we make sure to leave plenty of time at every appointment to get them all answered. Every child is unique and deserves to enjoy a quality experience no matter what their skills or abilities may be. Your child’s dental home should include a staff of pediatric dentists who understand how to work with children who have special needs. Whether your child needs long treatments broken up into smaller appointments or requires assistance getting in and out of the chair, they benefit from having dentists who know just how to provide the right amount of help at every appointment. Pediatric dentists enjoy going above and beyond for their patients, and they prove it by making the decision to attend two to three years of specialized education after regular dental school. We encourage you to check out our dentist profiles to learn more about each member of our team. We have all made it our mission to pursue educational experiences that allow us to deliver top quality services to the little ones that visit our office. You love your child, and their smile can brighten up any room. When you establish a dental home for your child, you give them the best chances of preserving each one of those tiny teeth. You’ll also love watching your child smile as they grow, and that is reason enough to find a dental home today. Going to the dentist can easily become the highlight of your child’s oral health care routine. We understand that choosing a dental home for your child is a serious decision. Be sure to visit our website or give us a call with your questions so that we can help you transform your child’s dental visits into a positive experience!